In the twenty-first century, advances in science and technology have given humans the ability to ‘recreate’ species in a variety of forms. 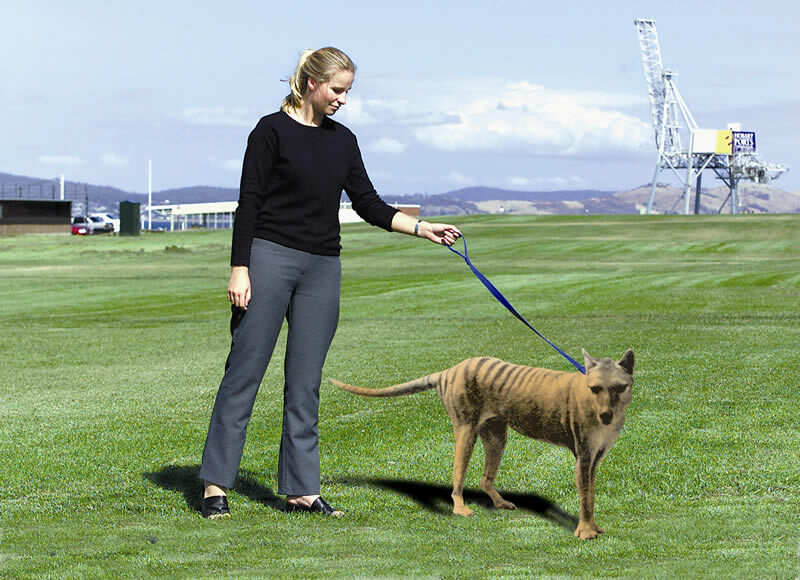 But three-dimensional reconstructions of the thylacine existed long before recent attempts at cloning the species. 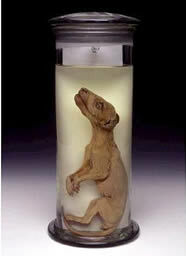 In 1999, DNA was successfully extracted from a thylacine pouch-young preserved in ethanol at the Australian Museum in Sydney as part of an attempt to clone a thylacine. In 2001 additional DNA was extracted from two other pups using tissue from bones, teeth, bone marrow and dried muscle. 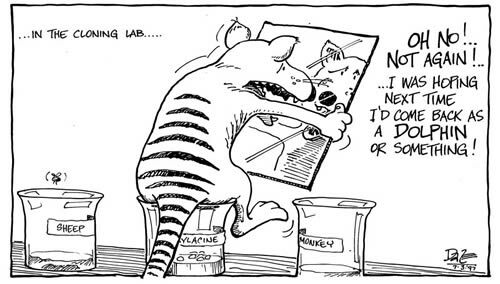 In 2002 individual thylacine genes were successfully replicated using a process known as PCR (Polymerase Chain Reaction). 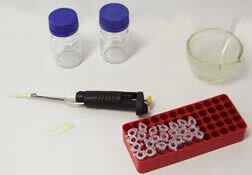 These PCRs replicated only limited fragments of the DNA that was undamaged and may have been functional if introduced into a living animal cell. At this stage the project was abandoned. 3-4 month old thylacine pup. We played God when we exterminated [the thylacine]. I would like to think by bringing it back we are playing the role of smart humans. Professor Mike Archer, Mercury Hobart, September 8 1999. What was thought to be an impossible dream is now moving closer to biological reality. But we don’t just want a strange animal pacing back and forth in a laboratory. We want to be able to reintroduce a viable population back into the wild. Professor Mike Archer, Daily Telegraph, Sydney, May 29 2002. What purpose does it achieve to create a mutant species in a wilderness that may devastate other life forms? If scientists want to see a thylacine such as a Tasmanian tiger they should refer to the appropriate geographical textbook. Editorial, Daily Telegraph Sydney, May 29 2002. 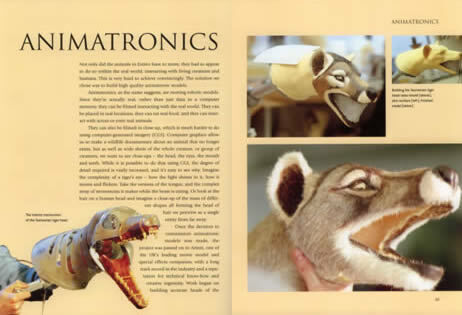 In 2001 a British television series, Extinct, 'brought to life' the thylacine and a number of other extinct species with 3D computer graphic technology and animatronic models. Extinct by Anton Gill and Alex West, Channel 4 Books, an imprint of Pan Macmillan, 2001. A recent Discovery Channel documentary uses the same techniques to visualise ‘the end of extinction’. Nineteenth and early twentieth century taxidermy specimens are also human constructions, similar to animatronic models today. They were often assembled from skins that were distorted by the tanning process, or were cut to fit existing ideas. Most taxidermists in Australia and Europe were unfamiliar with the living thylacine, so were influenced by inaccurate illustrations and fanciful stories. After the last thylacine in captivity died in 1936, many expeditions were carried out to find evidence of the continued existence of the species. Eric Guiler lists three major searches between 1937 and 1939, 16 additional expeditions, and many private ones up to 1992. There were regular reports of sightings in the 1950s and 60s, but no conclusive evidence has ever been found to indicate the species still exists. In 2005 a German tourist in Tasmania, Klaus Emmerichs, claimed to have photographed a thylacine. According to reports in the Melbourne Age and Sydney Morning Herald newspapers, the blurred images he produced were examined by digital forensics experts, photographic analysts, a biologist and a thylacine historian, but could not be authenticated. In the weeks following the story, The Bulletin magazine offered $1.25 million to anyone who could find a live thylacine. 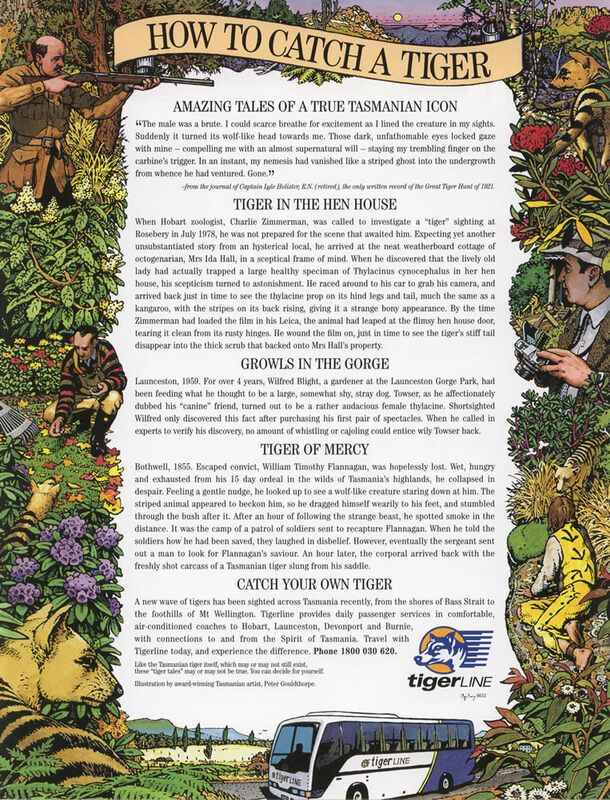 The offer has never been claimed but tourism advertising keeps alive the possibility of capturing what has so often been called an ‘elusive’ animal. 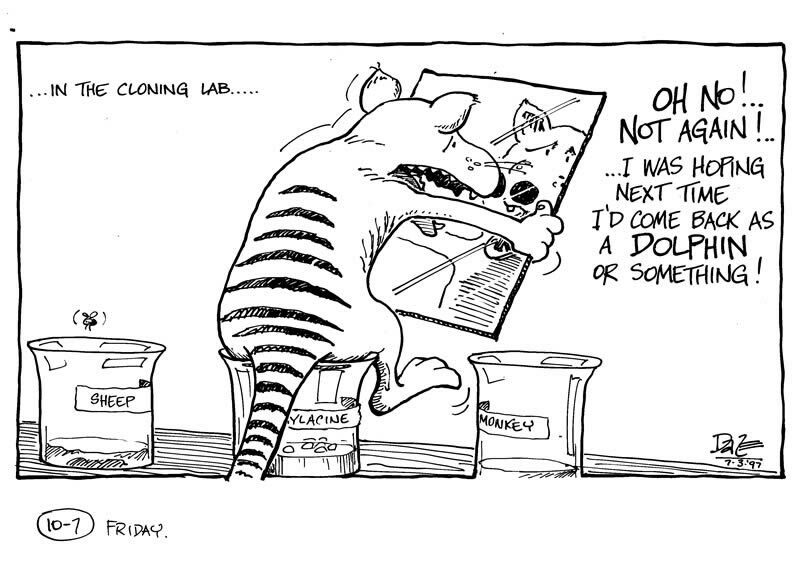 To successfully clone a thylacine molecular biologists have to extract intact DNA from the cells of a specimen of the species, place this DNA in an artificial cell membrane, transfer the enclosed DNA into the live cell of some other animal, and then grow the cell in the womb of a surrogate host. Not only did the DNA recovered from the pouch young during the Australian Museum’s project represent only a tiny portion of the animal’s genome (that is, the entire genetic code of the animal), the extracted DNA was found to be too fragmented or degraded to work effectively. Even if this part of the project had been successful, it may have been difficult to find a suitable host. The closest living relatives of the thylacine are the dasyurid marsupials, such as the Tasmanian devil. Not only are many of these animals considerably smaller than the thylacine, Devils are now endangered from a facial tumour disease. And would the result be a thylacine, or just another of the many representations humans have made of the animal? As there is an element of choice, as well as chance, in the selection of DNA used in the process, a cloned thylacine could well be considered no more ‘real’ than an animatronic model, or one of the fanciful images from the nineteenth century.